The upper and lower Bakken members are similar in that they are hard, siliceous, pyritic, fissile, brownish black to dark black, often noncalcareous, and organic-rich shales.3 The shales are very uniform throughout their extents; however, some cores of the lower shale have thin (3 feet) black limestone that is coarsely crystalline and significantly lower in organic content. 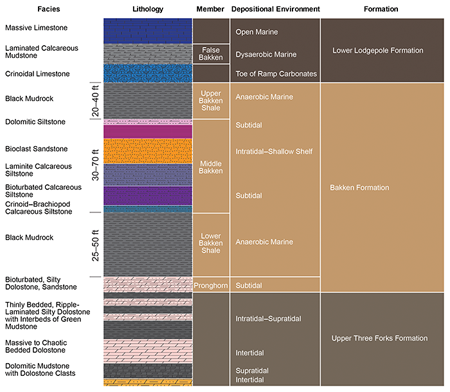 The middle member’s lithology is highly variable and consists of five distinct lithofacies. The unit is well-sorted (although bioturbation is common); well-cemented with calcite, dolomite, or silica; and light to medium gray in color. All lithologies within the middle member have low primary permeability and porosity. Webster, R. L., 1982, Analysis of petroleum source rocks of the Bakken Formation (Devonian and Mississippian) in North Dakota, [M.S. thesis]: University of North Dakota, Grand Forks, North Dakota. LeFever, J.A., 2005, North Dakota middle member Bakken horizontal play: Geological Investigation No. 8, North Dakota Geological Survey. © 1992-2014 University of North Dakota Energy & Environmental Research Center (UND EERC).